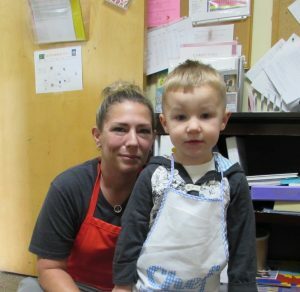 Miss Gina, our Kitchen Manager at the Henrietta Center, occasionally chooses a child or two to help pass out the afternoon snack! The children love helping and get very excited if they are chosen to be the helper! 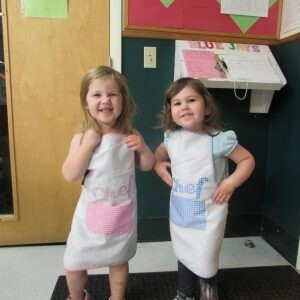 They even get to wear an apron! The children learn so much while doing this activity! Miss Gina discusses what the snack is, what’s it’s made of, and if it is cooked or fresh. If the snack is a fruit or vegetable, they discuss how it grows. As they pass out the snack, they practice counting by giving the right amount to each classroom. One of the best parts of helping is pushing the cart! Miss Gina gives them directions to familiarize them with the concepts of “right” and “left.” Delivering the snack throughout the Center enables the children to socialize with the teachers and students in the other classrooms. 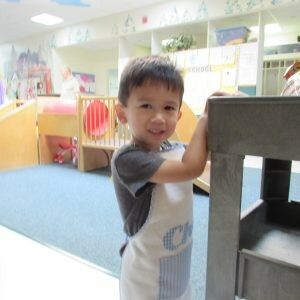 It is helpful for children to explore other parts of the Center so when they “move up” to the next classroom they are familiar with the room and the teachers in that room.